It's here! 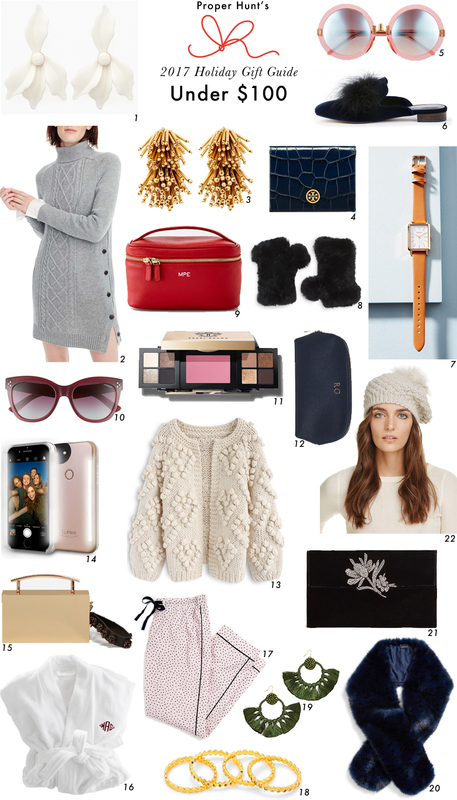 My gift guide for items under $100! This is definitely going to sound cliche, but I seriously want everything in this list. It all speaks to me and is all quite lovely in their own right, or at the very least quite useful. I mean who couldn't use another pair of pj bottoms, am I right? Those polka dotted ones are so sweet. I have been stealing Steve's fleece robe for years now and think it's finally time I get my own, hehe. I think this one from Mark and Graham is so classic and cozy (love that you can monogram them! ), I'd gladly give up Steve's for this one. Speaking of monograms, I'm kind of obsessed with anything that can be monogrammed including this jewelry travel case and cosmetic case. Ever since we've moved, I've noticed that my jewelry travel situation could be improved upon and I think that case would help out immensely. And I'm in desperate need of a makeup case for my purse. I need one that's going to be durable and not show a lot of wear (I have lots of food spills in my purse bc of my kiddos), I'm thinking this one just might be what I need. Okay time to get some gift shopping done! And make sure to check out my Gifts Under $50 guide! Happy Monday friends!! For sewn in human hair extensions you will need to gather the following items scissors, shampoo and conditioner, wide tooth comb and an optional human hair extensions sale removal tool. Keep in mind that these extensions that are sewn in can become tricky to remove and can also potentially cause remy human hair extensions loss if a system for removing them is not followed. The first step to removing them is to locate the thread that was sewn to your natural hair. Once this has been located you are going to use the scissors to cut the thread. However be cautious so you don't cut your hair. Once the thread has been cut you can pull the clip in hair extensions from your hair and repeat all the way around your head. After all extensions have been removed wash and condition your natural hair. For glue in real hair extensions you are going to need shampoo, conditioner, glue dissolver or remover and a wide tooth comb.